Actually, I don't know where I got the first rate thing from. I referred back to the quote I was thinking about in the last post. Thanks for the pictures, Jen. So this kind of brings up bread again. Was bread never cooked on board? Or was it simply uncommon or not for the common sailor, just the Captain and officers? What I really need is someone with access to manifests and wills to do a search. If these, or similar ovens were recorded as having been aboard I would think that would definitively answer the question. As to baking bread on board, never say never. It might be done, but more likely in something like the bake kettle that is on the far right of the pic. 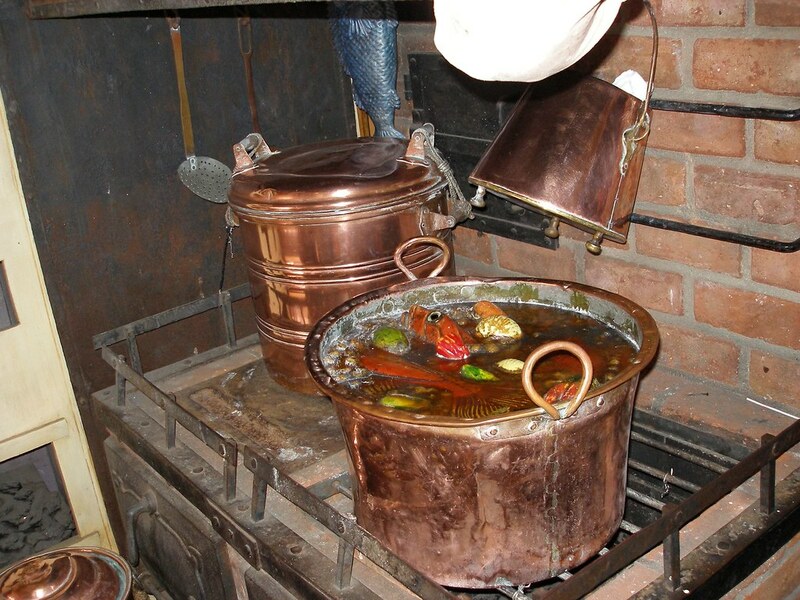 It would require a good bed of coals above and below, which may work within a ship's galley--you can stack other pots on top of the bake kettle to double up on using the coals. But it would not be a lot of bread at a time. Then there is the whole issue of other equipment. Yeast could be stored, dry, in a dormant state inside dried bread dough brought along for the purpose and continued throughout the voyage. Then you would need some of the water supply to bring it back to life. Or use some of the ale/beer on board. A sponge would be made, allowed to work, then more flour added to make the dough. The galley would most likely be a good environment for allowing it to rise. Just depends on a whole lot of factors regarding distribution of the ship's supplies, wether the officers ate that much better than the men, etc. Not to mention the abilities of the ship's cook. I doubt the common sailor would reap the benefit, beyond the smell. Even the larger galleys aren't all that big. You really have to be quite organized and spatially aware when working on a decent sized hearth, cooking for a lot of people. But a galley would even require more of it's cook. And I suspect this is why the Navy had contracts to make ship's biscuit. Easier to make, package and store, distribute as needed. No additional risk of fire or use of extra resources once under way. Good luck finding the documentation! Let us know what you find out. I really don't expect to discover that bread was a common item. From what I have read the general meal while underway was some kind of stew and ship's biscuit, over and over again. And again. Ad infinitum, ad nauseum. As for the first raters and large 2nd raters, as Mission says, they had more comforts. In the plan I posted in post #8, the galley and the masonry for the fire has two distinct sides, one marked #32 "Captains Cook Room", just above the little guy cooking. It seems to have a separate firebox, a raised hearth, probably a brick floor. This is where I would expect to find the more normal "home style" cooking equipment, including reflector ovens, if they were ever aboard ship. Just to make it perfectly clear what I am trying to accomplish, I am trying to add a tin kitchen/reflector oven to my careening camp. I need some documentation that one was aboard a ship, any ship, and in any capacity, including as cargo (That oven? I plundered that offen a whaler/merchantman. Never use it except ashore...) If we can establish bread baking aboard ships at that time, so much the better for our understanding of the times. The question of bread probably does come down to frequency. It also comes down to the cook, and with navies, quality gives way to quantity and convenience. Bread on the high seas probably did exist in a very limited way, so that's when it becomes hard to find historically. It's more likely to be something we trip over, than something that we purposely discover. Jim's mutiny comment reminds me of a tactic my Grandfather used while living in a very poor, dangerous part of Southside Chicago years ago. He worked at a bakery all day and made certain that he baked 'extra bread' every night just before closing. Then he would carry generous portions of this fresh, delicious smelling bread on the cross town trains. He would share this bread with everyone on the train and it got to the point where if anyone bothered him at all, all the regular commuters would defend him, because he was the 'bread guy'. There is nothing in the world quite like the smell of freshly made bread. What about the liquid bretheren: freshly brewed beer? And even better, freshly poured beer! Well, one must have beer with one's bread now, mustn't one? If you want to check out Heart to Hearth Cookery, choose the blog from her menu and you can see some of Susan's results from her baking in a tin reflector oven. It's under "uneven baking" in her post. Here's another great galley image. While it does come from the Disney ship Columbia, it is fashioned beautifully after other ship galleys. The Columbia was vessel of the 1790s and when historian Ray Wallace built the replica at Disneyland he borrowed heavily from the 'Bounty'. Much of the layout in the interior was designed by chief art director Kuri. You'll note that all of the cupboards have high lips at the base to prevent anything from falling from them. There are no cupboard doors or anything that can swing wide. The lowest cupboard space is a coal bin for the fire. The kitchen is fixed with a high cross rail so when the cook is moving about with heavy pots or trays there is a brace to lean upon or catch him if he sways. 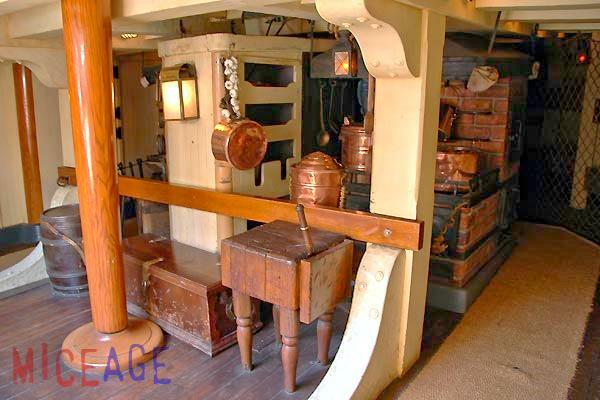 The tight quarters, which come naturally with ships and the conservation of space, actually work in the favor of a cook. The shorter the distance to travel with water, kettles, pots, etc., the less likely one will be overbalanced. One simply turns in place to work. Cookware is at a bare minimum. The problems of storing dishes are easily maintained, because each sailor keeps his own bowl, spoon, fork etc. It looks like iron working tools and an anvil might be stationed on the opposite side of that cupboard larder. It's possible that there is a second bricked in space on the other side for limited metal working. I've never seen this setup before, but it shows pragmatism, if not accuracy. A detail of Columbia's stove. It's all brick with metal fittings and doors. The doors are not accurate for very early galleys, but the 'fish parts' stew is funny. 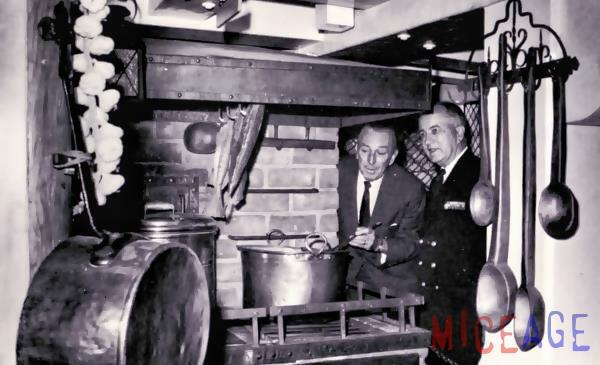 Another shot of the cozy space with Disney himself. 'fish parts' stew is funny. Oh ya, that's why I won't eat fish chowda'... at least leave the squid head out. Is that the Kraken in that stew? Great pictures, but a little late for our time. Now with the built-in oven there would have been no use for a reflector. Still, nice. Edit: I believe the big doors you see on the front are for stoking the fire. The oven is the little iron door in the flue next to the blue fish in the second picture. Having given this subject a bit more thought, I have come to the conclusion that tin ovens would not have been shipped completed but built locally by your neighborhood tinsmith. So there would not be any shipping manifests listing them. Sheet tin, maybe, but not completed items. Nor would they have been commonly used aboard, even on 1st raters, if at all. Now the point of this whole exercise was to qualify the use of a tin kitchen in a careening camp. Hence I have come to a further conclusion, that if the careening camp is in a remote area not associated with a friendly town then the tin kitchen would not have been available. However, since the Mercury careen is scripted to occur near a sympathetic town, a tin kitchen could easily be procured from said town or have been brought by someone seeking trade or offering services to the pyrates ashore. Oh, I've made bread with a dutch oven. The tin kitchen was more for roasting. Although I guess it could be used for baking, if a shelf was installed. Another product film by Jas Townsend. Sorry, that should be Dixie Tinworks http://www.dixietinworks.com/ . Interesting. With tin ware, part of the cost is the quality of the tin, though. I would be curious to see a comparison between the two regarding that. Looks like a good entry price for a tin kitchen. For a careening camp, there are other ways to roast meat, though. If you feel a need to have a surface reflecting heat back, or to create a wind break, strategically placed boards work. Could make some interesting use of weathered boards. I haven't yet pulled the trigger on a tin kitchen but am leaning toward the Dixie, simply on price point. I will post a review if I get one. As for camp, indeed board reflectors would be very accurate and I have used them in Scout camp situations. Aromatic wood (cedar or fruitwood) adds to the flavor of the dinner. They work, but not as well as a reflector. Decreases cooking time by a lot, or so I'm told and have read. Oh yes, cedar and fruit wood are great for that. Have you tried planking fish on them? _That_ would be a great thing to be doing in camp! Looking forward to hearing how you get on with the Dixie tin kitchen. If the tin isn't really great, just make sure you clean and dry it asap, and keep it really, really dry. Maybe even store it with the stuff that pulls moisture out of the air to prevent rusting. 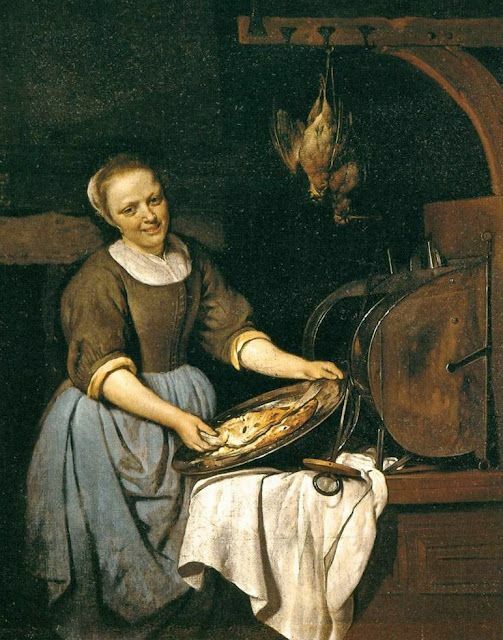 Funny, I ran across tin kitchens in a period advertisement recently, somewhere between the 1730's and 1760's, in the Carolinas iirc, being imported aboard ships. Along with at least two types of bread _and_ ship's biscuit in barrels. I think I printed out that bit and put it in a binder to take with me to Florida. Will dig it out when I get down there to see. With any luck I can look it up again when I am there if I didn't print it. Very interesting. I would have thought shipping something with so much "empty space" would have been unprofitable. Sheet tin would be easier to ship to a local tinsmith to fashion an oven out of. Ah well, there is a reason it's a good idea to find more than one reference for items. In this case it appears there was a typo or spelling mistake in the advertisement. Many of these ads run several weeks in a row. What was "tin kitchen" in one was "tea kitchen" in others by the same vendor. I wouldn't completely rule out their importation, but we would need to have a better handle on the trade of the tin smith (white smith?) in the colonies. When established, etc. Checking out tradesman ads next. Chris Bell pointed this one out on the Authentic Pirate Living Facebook page. Gabrieal Metsu painting. The earlier links in the thread didn't work, so I couldn't remember if it had been posted.